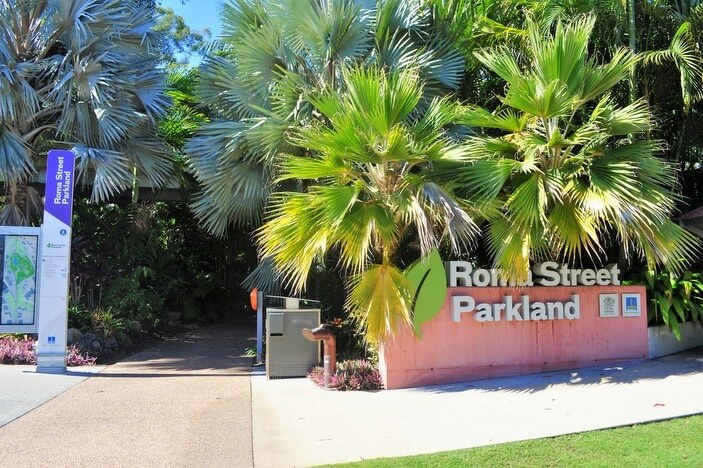 An inner city oasis, Roma Street Parkland is centrally located and provides several areas for Brisbane Kids to explore, including playgrounds, walking trails and ponds containing wildlife. 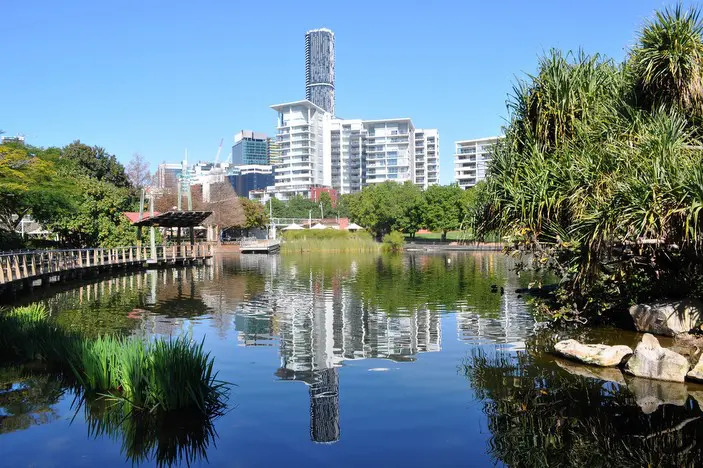 Originally a significant gathering place for the local Turrbal Aboriginal people, Roma Street Parkland is a beautiful green oasis in the heart of the city. 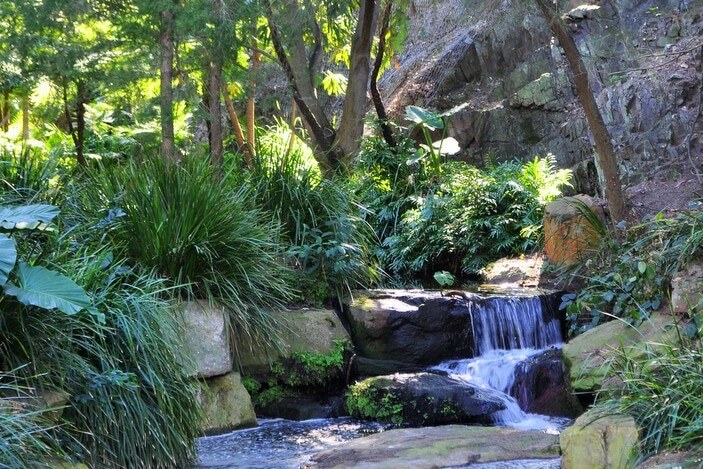 It contains a wonderful collection of subtropical gardens, water features, lawns, playgrounds, eating areas and walking paths and is easily accessible for those using prams, wheelchairs and scooters. 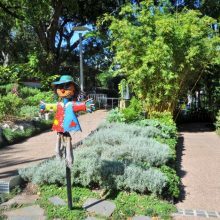 Roma Street Parkland are situated in the heart of the city and is an amazing place to visit with your Brisbane Kids. 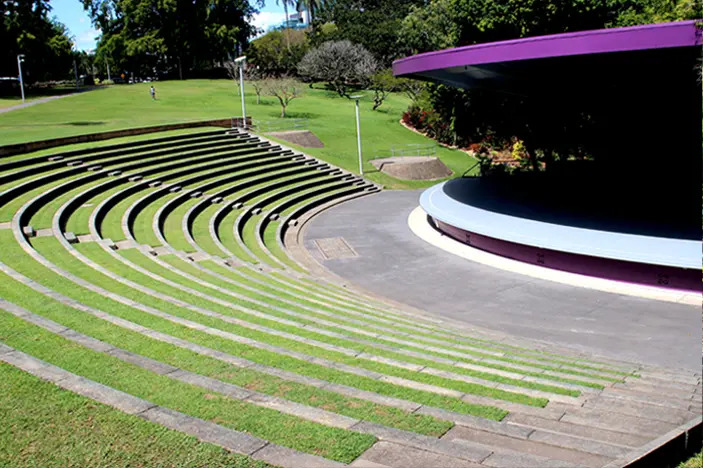 Spread generously over 16 hectares, its lush green lawns, flower gardens, forests, lakes and playgrounds are only some of its features and you can easily spend a full day of family fun and exploration there discovering all it has to offer. 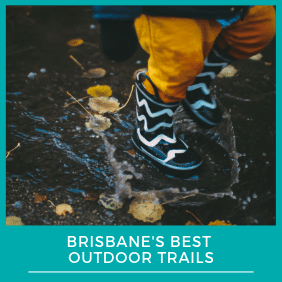 Perfect for kids of all ages, you can explore the parkland easily on foot at your own leisure or via one of the many free guided walks. 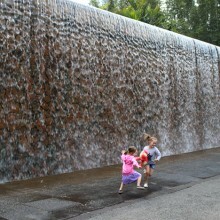 Most popular with kids though (and adults too!) 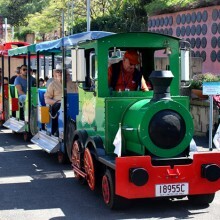 is the sweet, colourful, trackless train that you can board for a simple gold coin donation. 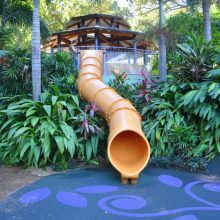 Dropping off and picking up from numerous spots the ‘Parkland Explorer’ weaves along the pathways, crosses bridges and even navigates the different levels of the forest section all the while giving you an audio guide of the park. 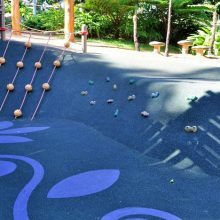 Located in the upper part of the Parkland, and split into two areas, the Children’s Garden is a fun, attractive and creative playground for kids. 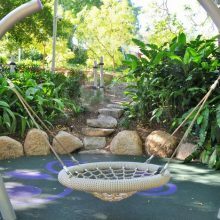 One playground is located near the amphitheatre, it is a sweet, imaginative space set in a lush, shady part of the gardens. 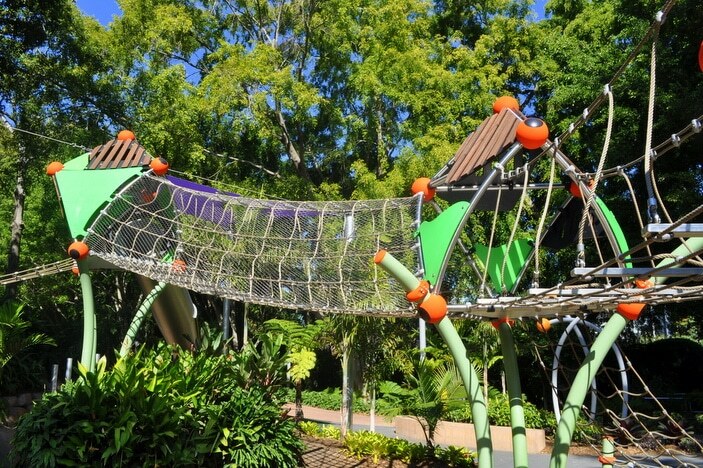 There is seating to sit and watch as your little ones take on the treehouse jungle themed area. 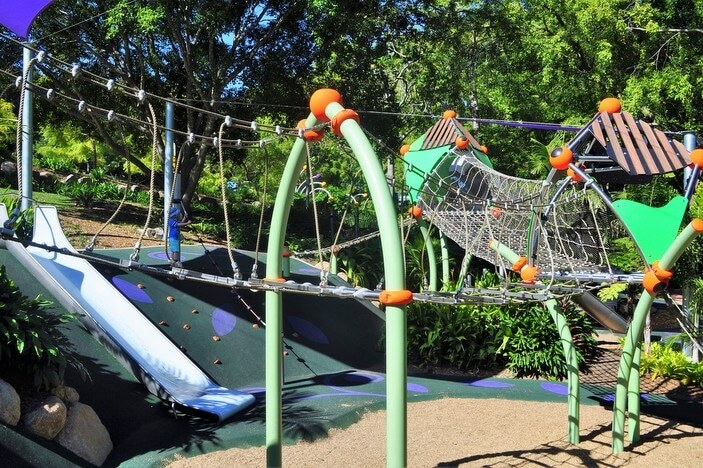 The playground features wobbly bridges, 2 slides, rock climbing pegs, tunnels and a spinning roundabout. 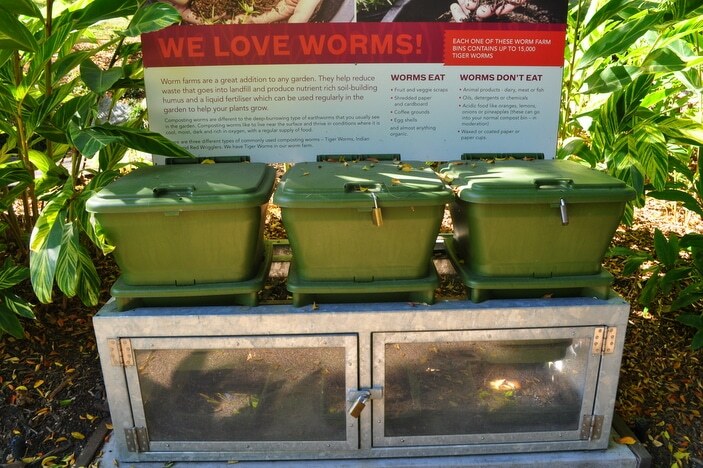 Children can creep along secret pathways through leafy ferns and sit at tiny garden tables. 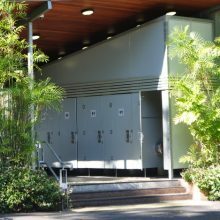 There is a rubber softfall mat and clean modern toilets close by. 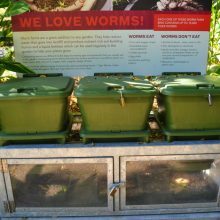 Linking the first playground to the second is a path winding past a vegetable and herb garden and a worm farm where you can encourage your children to put your picnic scraps. 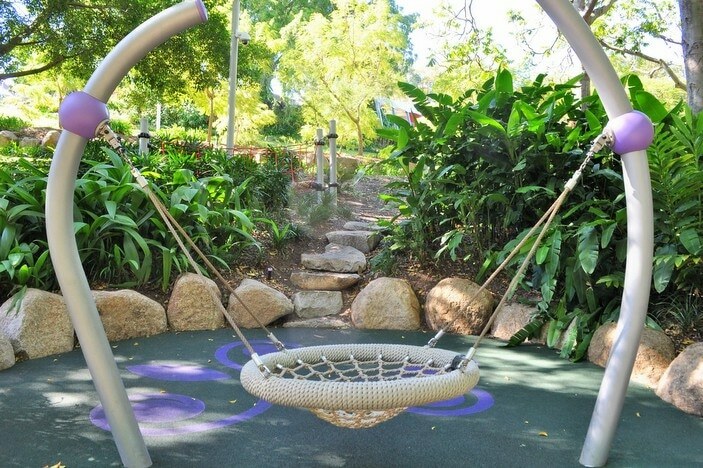 The second playground in the Children’s Gardens is suited to slightly older children. 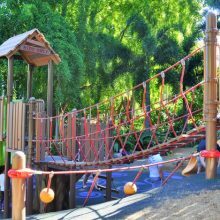 Rope bridges and climbing nets link tall platforms that lead to a metal slide. 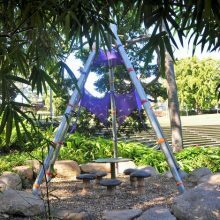 There is a shade sail covering part of the structure, but I imagine the slides could heat up in summer. 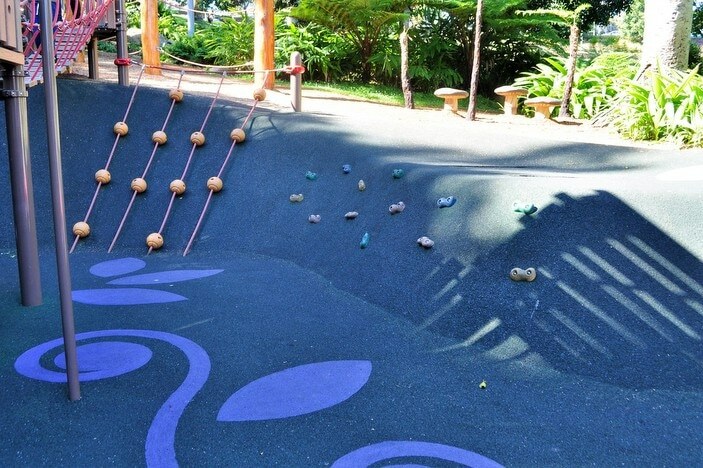 Rock climbing pegs traverse a small softfall incline where kids can access another slide. 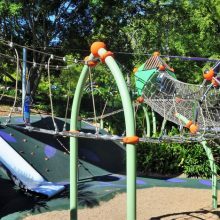 There is also a basket swing and a balancing rope beam. 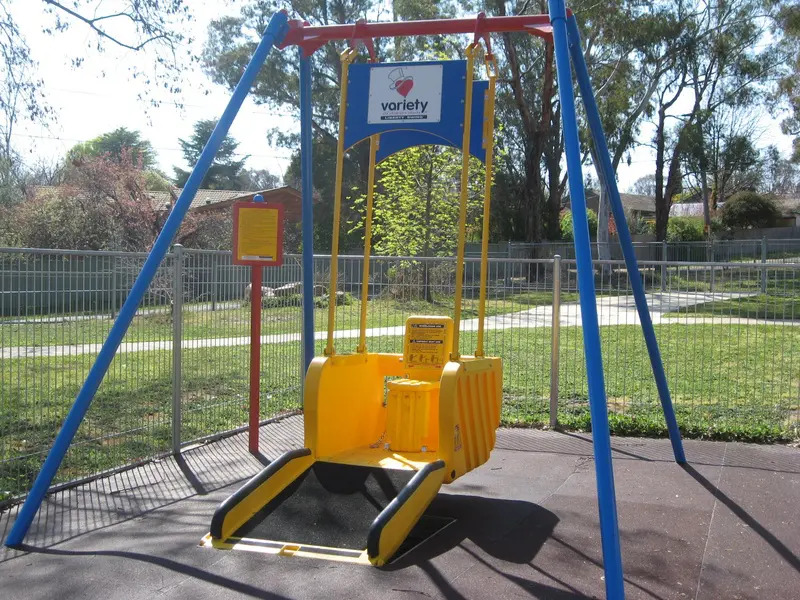 Neither of the playgrounds are fenced. 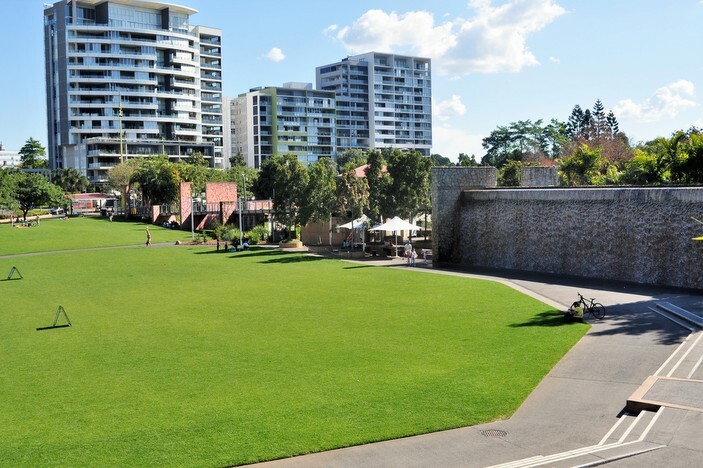 There is lots of beautiful grassy areas for picnicking, a free BBQ, table and chairs (not in shade) and a water bubbler and water bottle filling station. 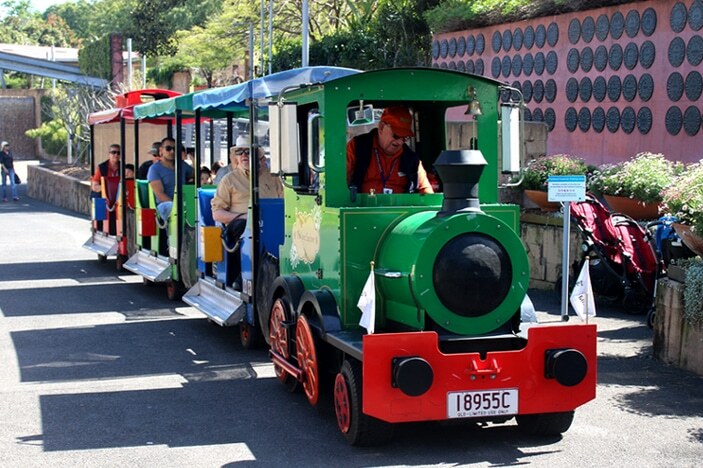 For a small gold coin fee, the Parkland Explorer trackless train will pick you up and drop you off at various points around the gardens as it meanders its way through the Parks many landscapes. 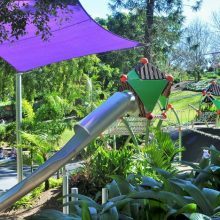 This colourful service is very popular with families and operates Wednesday to Friday 10am-12.30pm and Weekends 10am-3pm. 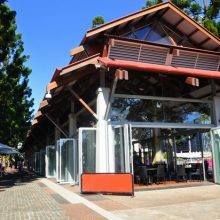 Please note: The timetable can be affected by volunteer availability or bad weather. The train wasn’t operating the day I was there (and it was a Saturday) so it pays to check on their Facebook page to get updated running times. 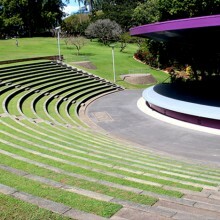 The Spectacle Gardens are a beautiful display of finely manicured plants. 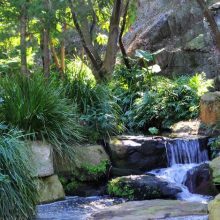 From exotic subtropical species to rows of brightly flowering favourites set amongst hedges, water features and sculptures, it is a stunning display and is sure to keep everyone happy. 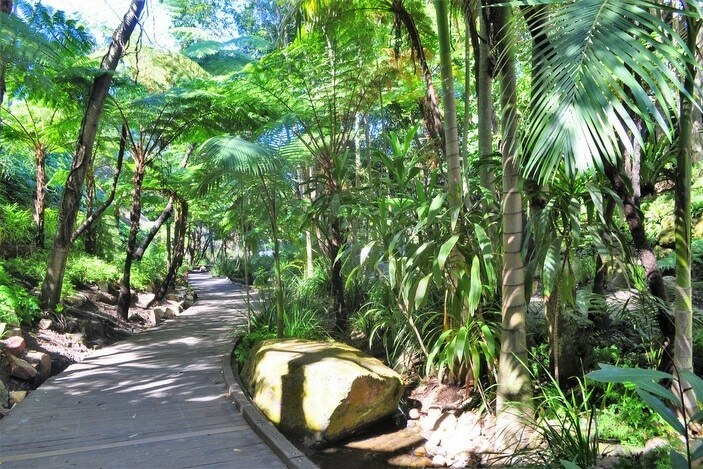 Fern Gully is a short walk through a cool rainforest environment. 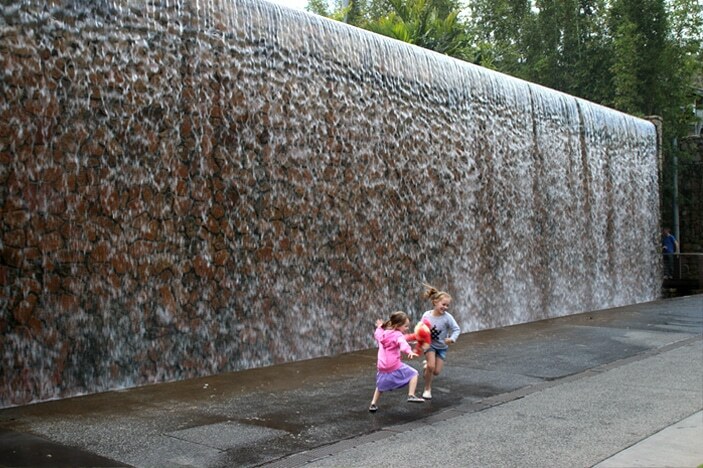 Your children will love the towering ferns and waterfalls. 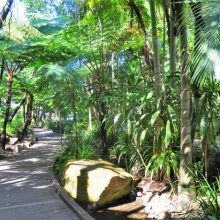 See how many Water Monitor Lizards they can spot on the trees and rocks. 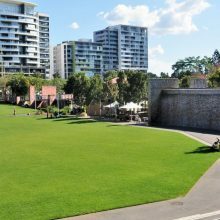 The Meadows are an expanse of soft green grass perfect for soccer games, picnics or laying back and watching the clouds. 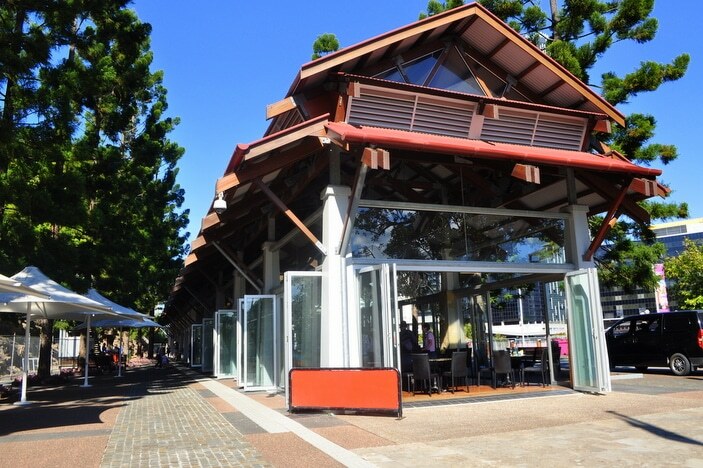 The lake is home to many bird and reptile species, it is fenced and has BBQ’s and seating beside it. 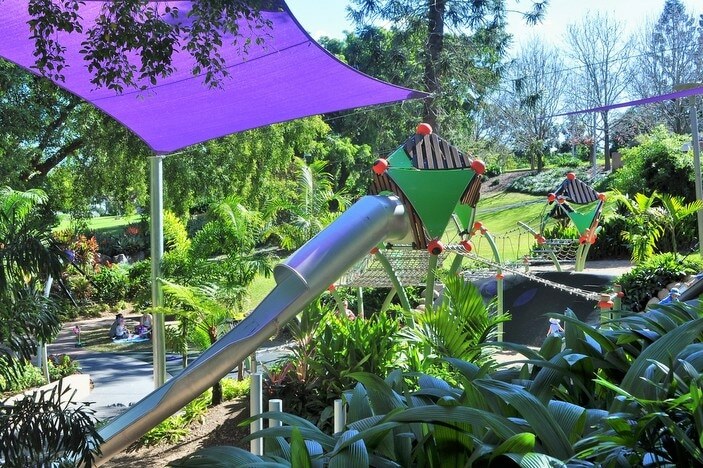 The variety of different spaces within the parkland is fantastic for challenging the imaginations of Brisbane Kids. 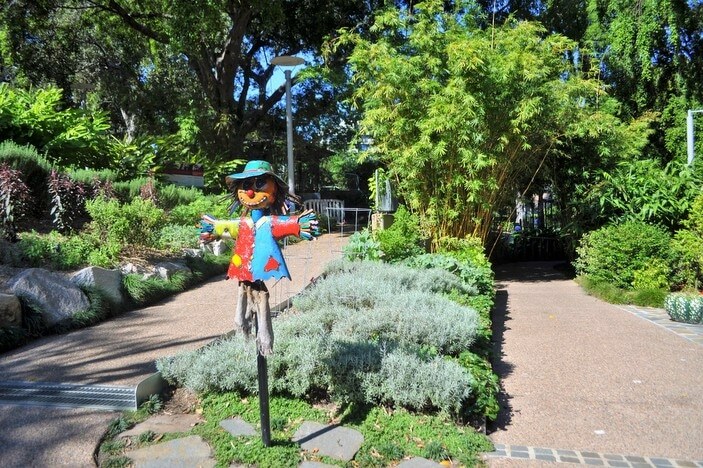 Little ones can explore the jungle under the big fig trees, or spot the rainbow of colours in the flower gardens. 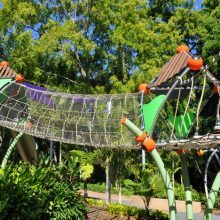 The play equipment easily lends itself to games of shop, swinging monkeys under the trees and crossing the play bridge over the river full of crocodiles. 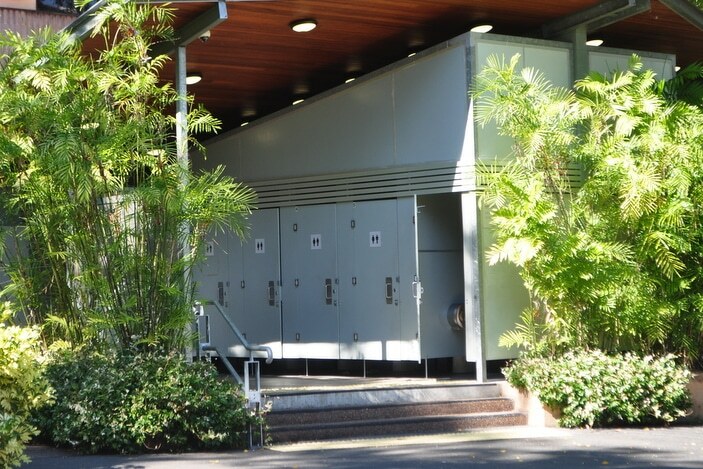 Roma Street Parkland does have wheelchair accessible toilet facilities. 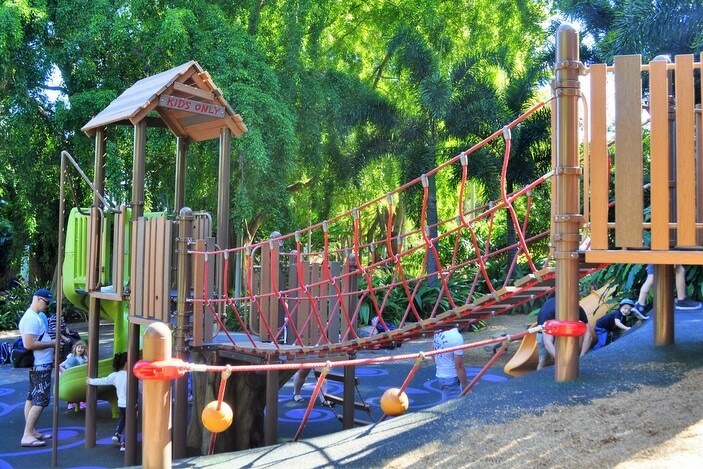 The playground is unfenced and shaded much of the day by massive fig trees. 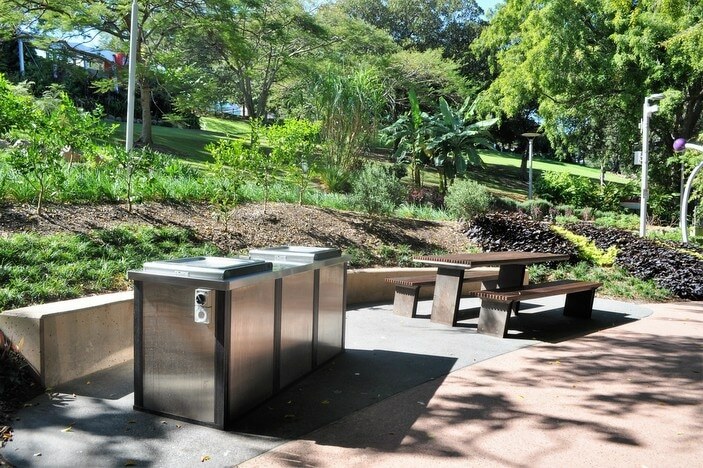 There are bike and walking paths throughout the parklands suited to wheelchair and pram use. 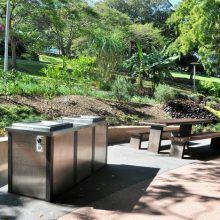 Tables and electric barbeques are located in many spots for public use. 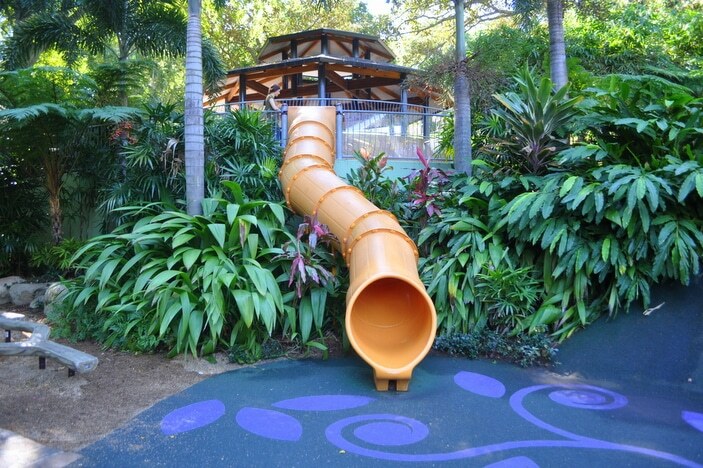 Another great nearby north-side Brisbane Playground is Neal McCrossan Park. 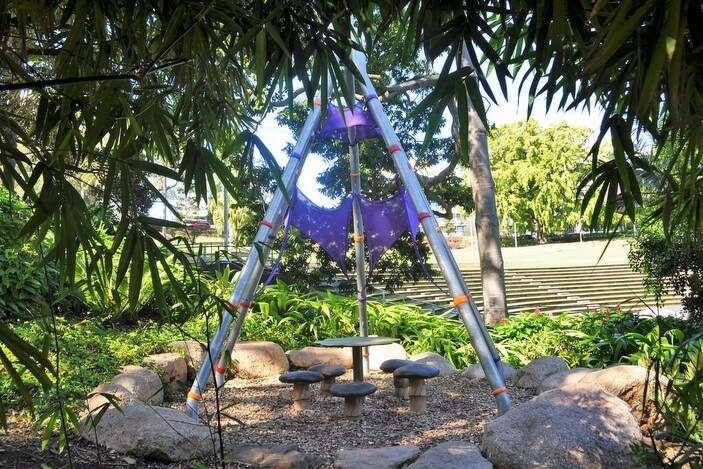 Roma Street Parkland Playground is located on Wickham Terrace in Spring Hill. 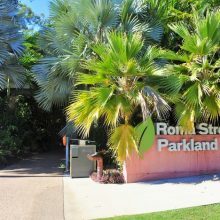 You may also like to check out our guide to the features of the parkland on the Roma Street Parkland map to extend the fun on your visit. 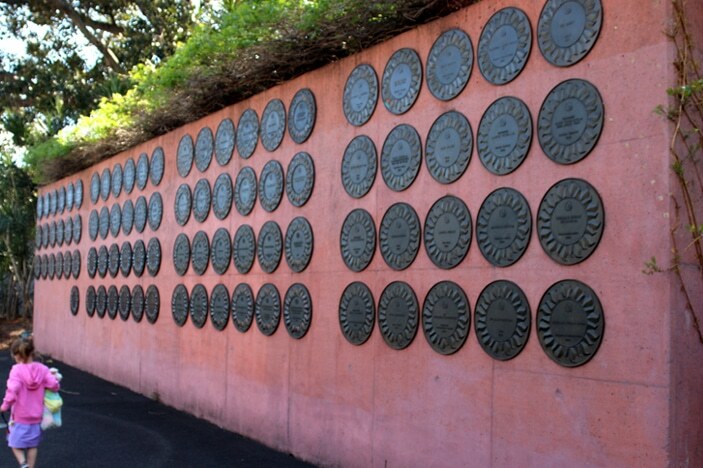 There is no road too long to the man who advances deliberately and without undue haste; there are no honors too distant to the man who prepares himself for them with patience…. 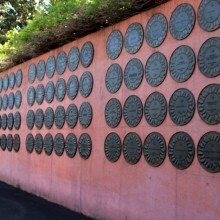 Every science begins as philosophy and ends as art….